Payments touches everyone. Hence, it is not a surprise that the industry is worth £75 trillion. With digital innovation adding new payment instruments for consumers, speed and transparency coupled with good user experience have become the norm in the area of payments. Following suit, more and more businesses now too are expecting payments to be processed in real-time. 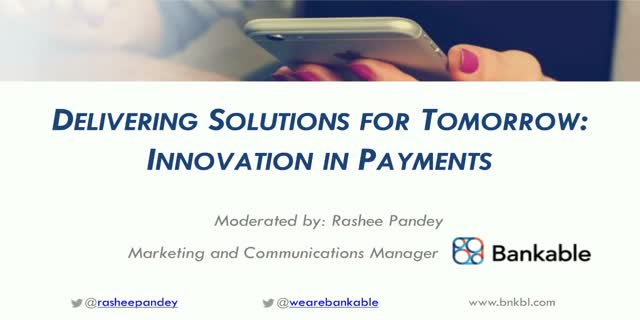 With increased expectations and continuous innovation, let’s discuss the present state of innovation and trends in payments globally, the industry challenges and debate on what is the best way forward to innovate in payments. o Which other industries, besides banking, is payments disrupting/innovating in? o What current B2B and B2C payment solutions stand out? o Identity and security? Is biometrics the answer? o How should/would the payments ecosystem look like in the next 5-10 years? o Is collaboration between players in the payments ecosystem the answer to innovation? o What role will open APIs play in this innovation process? o Will digital currencies play a significant role in everyday life? o What is UK’s position in paving the way forward for innovation in payments globally?